After the third rollover, you will have the option of launching a new product into one of the three available Market Segments. 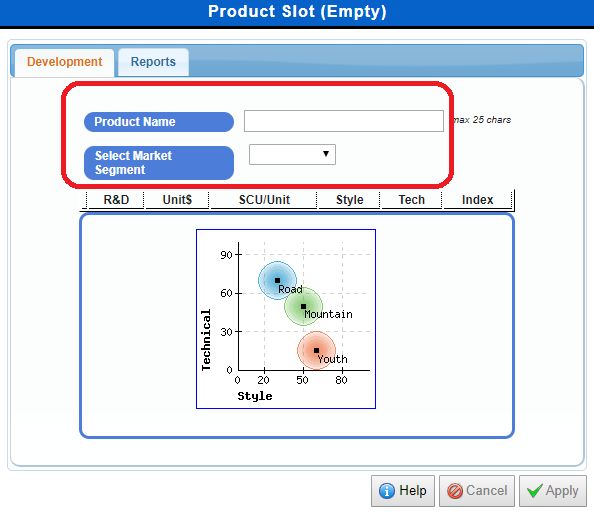 The Product Slot screen is used to make decisions regarding the development of new products. Launching two products into the same Market Segment is not recommended. Your products will compete against each other and will cannibalize your Market Share. Your first decision when launching a new product is to give your product a name. Next, you must select which Market Segment your new product will service by using the Select Market Segment drop-down menu. To save your decisions click Apply. Launching a new product will cost you $1m in research and development costs. You will immediately have the ability to make decisions for your new product based on your Product Strategy. You will need to set the Price, Sales Forecast, Marketing Expenditure and the Production Levels for your new product. You will see the results of your product after the fourth rollover on the Product Summary report and the Market Summary report. 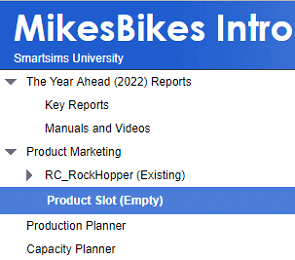 Over the next two decision periods, you will have a new empty product slot each period.